A brief relief from the cold, but -40 wind chills return soon. Light snow started the second full week of February in Saskatoon as temperatures dipped back to -26 with wind chills as cool as -39 to start the day. Snow continued through the morning as the mercury climbed up to -21 C heading into the noon hour. Two to four centimetres of snow is expected before it starts easing into the evening after climbing up to an afternoon high edging toward the minus teens. Once the snow eases, clouds will continue before a bit of clearing potentially pushes in overnight as temperatures cool back toward the -30s. -40 is around what it’ll feel like with wind chill early Tuesday if skies do clear out by the early morning with a mix of sun and cloud sticking around throughout the day. A few more clouds are expected to slide in late in the day as temperatures climb up to around -21 degrees for an afternoon high. Saskatoon remains sandwiched between systems on Tuesday bringing variable conditions to the region. An arctic high pressure system swinging in will keep skies sunny until later on Friday when some clouds finally start building in. The clear conditions will allow overnight lows to drop into the -30s with morning wind chills edging into the -40s each day before the sunny afternoons help temperatures rise close to or into the minus teens. 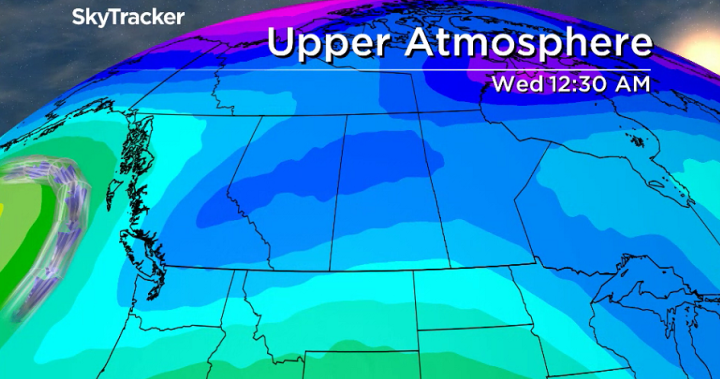 Cool air continues to funnel into Saskatchewan on Wednesday as another arctic high pressure system pushes in. Clouds return for the weekend along with a chance of snow both Saturday and Sunday as daytime highs climb back into the minus teens with morning lows in the mid -20s. Angela Campbell took the Feb. 11 Your Saskatchewan photo in Patuanak.